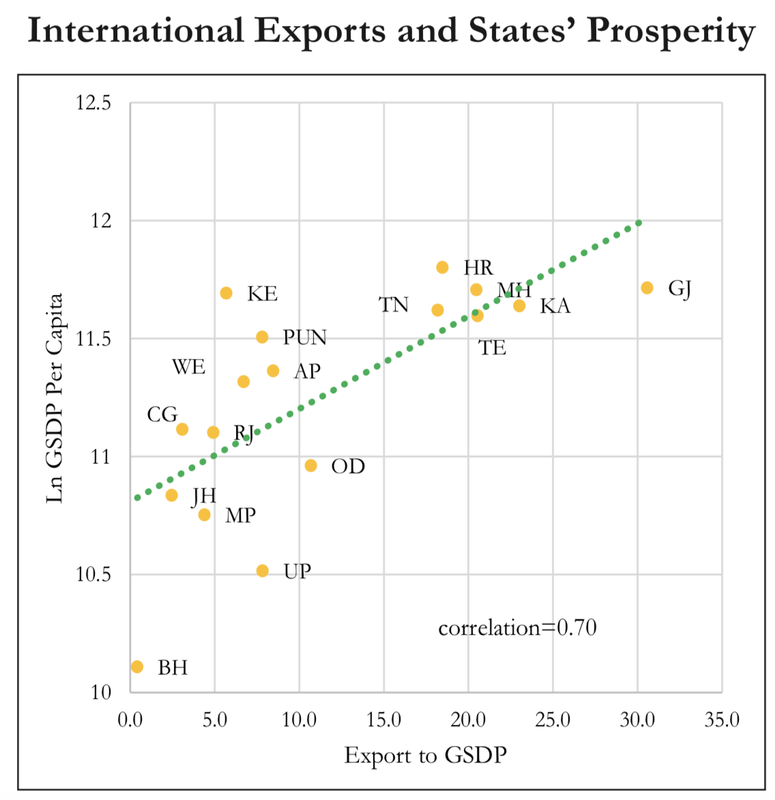 Economic survey states that there is a strong correlation between prosperity of a state and their participation in international and intra national (inter-state) trade as shown in figures. 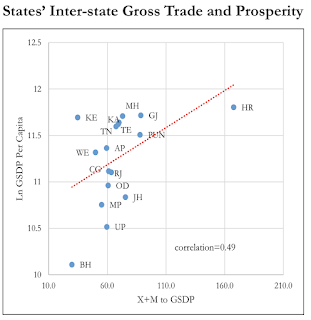 The only outlier appears to be Kerala (KE) which seems to be doing well and yet not participating in international or intra-national trade. 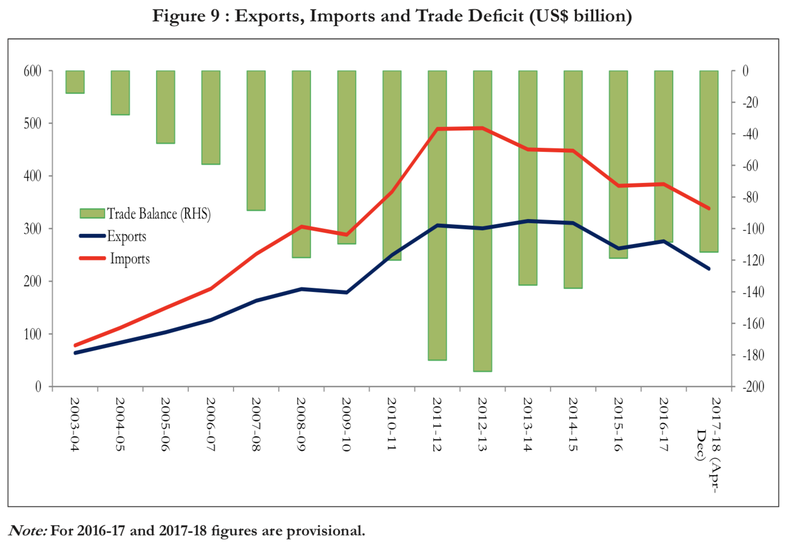 This is partially explained due to the Kerala's economy earning through tourism and remittances which has not been probably factored into as trade. 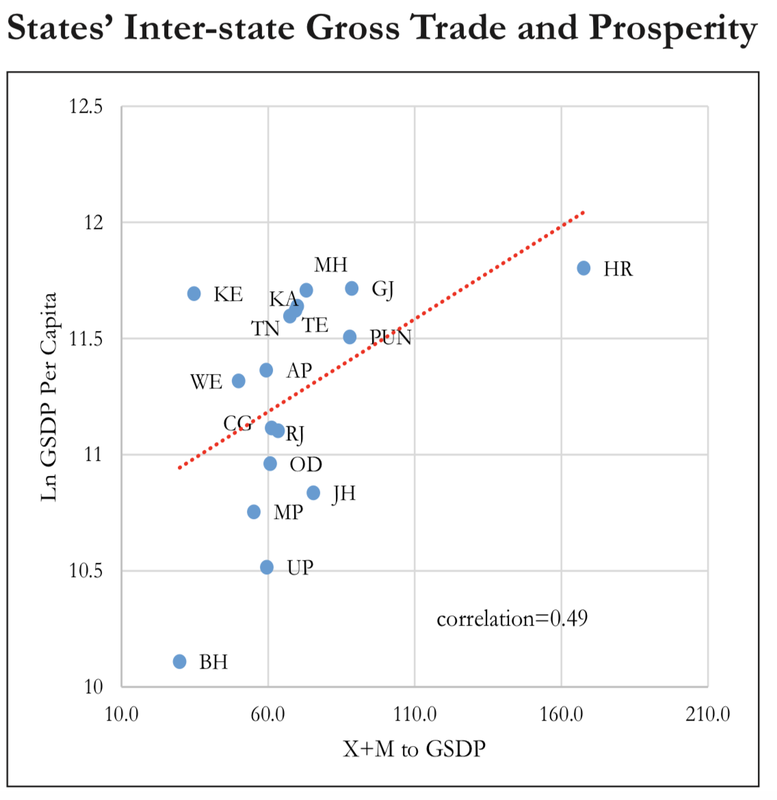 The survey doesn't attribute causation of one on another; it just points out this important fact as a correlation.  The impact on MMF-RMGs increased gradually over time; by September 2017, the cumulative impact was about 16 percent over other comparator groups. 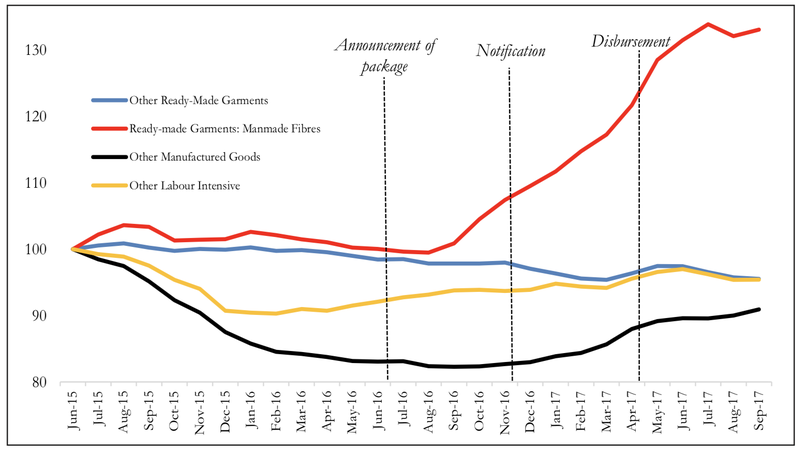 The figure below shows the growth in clothing exports compared to other labor-intensive and manufacturing goods, which did not receive ROSL. 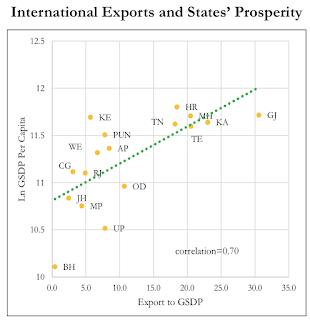 The positive impact on RMGs made of MMF after the package emerges starkly. While it appears that RMG was making a turnaround at the time of notification, and given that the survey itself doubts the DD approach of isolating the effect, we need to look at the data more closely before jumping to conclusions. 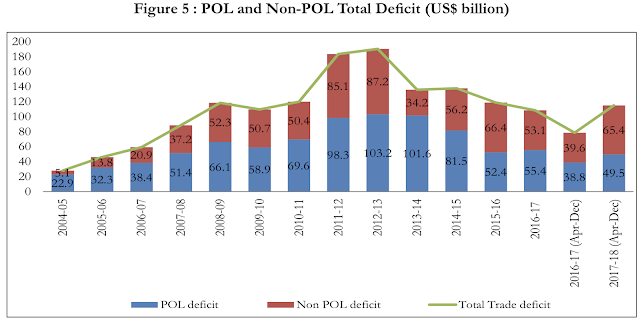 Nevertheless, survey has done well to open up this question to public debate. 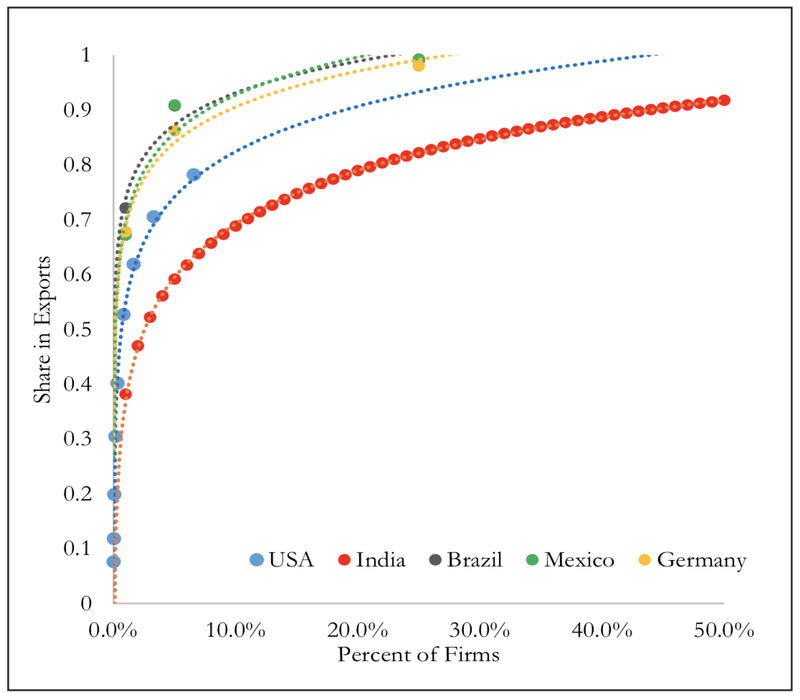 Top 1 percent of Indian firms account for 38 percent of exports; in all other countries, they account for a substantially greater share (72, 68, 67, and 55 percent of exports in Brazil, Germany, Mexico, and USA respectively). And this is true for the top 5 percent, 10 percent, and so on.